My name is Maureen – or as I’m more commonly known here in the office, “the Intern.” Over the summer months, I’ve had the pleasure of helping out the team at Rignite with a variety of different tasks. As I prepare to enter my senior year of college, my regular 9-6 schedule this summer has really helped me prepare for my transition into a “real person” in “real life.” At school, my normal routine consists of about 2 hours of class followed by laying out in the sun on my university’s beautiful California campus – quite a difference from being focused all day long in an office. Luckily, our office has a killer view. 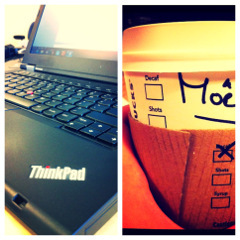 And although my coolest Instagram all summer may or may not have been a “picstitch” of my Thinkpad and my Starbucks coffee cup (Venti), I’ve certainly gained a new appreciation of social media, particularly from a business perspective. Not to mention probably more experience in a professional setting than any other internship I’ve done. Like I said, my duties at Rignite have been widespread! I’ve had the opportunity to dabble in our social media marketing, sales, and new client acquisition (leads management – how do I put this?). One of my favorite tasks was to search for content to post on our Facebook & Twitter pages. Ever wonder how “Social Media Marketing Lessons You Can Learn From Justin Timberlake” got into your newsfeed? Yep, that was me… but I bet you clicked on it! I was able to sit in on some really cool meetings about the growth of our product. New developments seem to be working their way into the software on a weekly basis. Not only have I expanded my vocabulary to include some impressive acronyms (UI, UX, CTA, CPC, you name it, I know it), but I have been able to witness an entirely new aspect of the product be built from the ground up. From the white board stages to wire frames! That’s something you definitely won’t experience sitting in a college classroom. I’ve even been able to help with content creation. I’ve attempted to capture your interest with witty and/or informative tweets to feature our blog pots. They also let me make use of some of the HTML coding that I learned in high school to edit those blog posts. A typical elective for a silicon valley 16 year old… who knew it would come in handy 5 years later?! Maureen started at Rignite as a summer intern. Now in her senior year of college, she has joined as a part-time member of our marketing team. She blogs about social media from the perspective of a 20-something. Hi Stephanie, thank you so much! I loved your post, I always like to read articles that incorporate a bit of education with an interesting twist. Who doesn’t love JT? !